Many thanks to everyone who came to speak or to listen at the conference All Together Now? 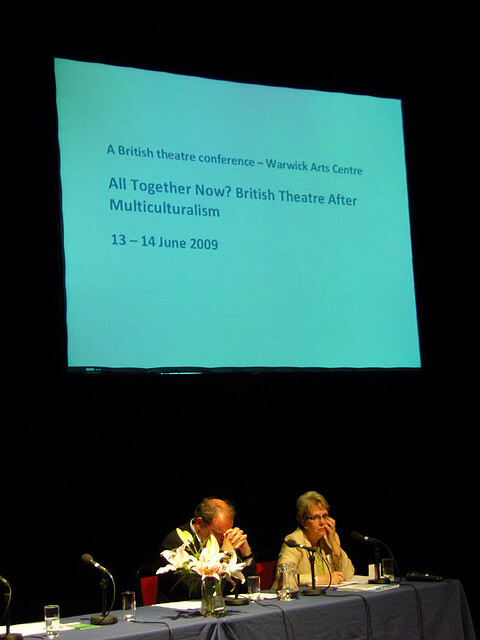 British Theatre After Multiculturalism. 120 delegates from across the world gathered at the Warwick Arts Centre to address a range of questions around the debates about British theatre and multiculturalism – from the promise and perils of theatre as social engineering, the way theatre can explore the histories of identity, the complexity of colour-blind casting, the challenges of ‘regional’ theatre and finding new audiences, the rights and responsibilities involved in offending your audiences, and the troubled state of identity politics. We are keen to make these conferences reflect the key concerns of the theatre community so if you have any suggestions for changes of format, topics for future events, or indeed – equally useful – comments on what went right, please get in touch via the contact page. Audio files of all the conference sessions are available here. Do check back to the website for information on the British Theatre Consortium’s other activities.